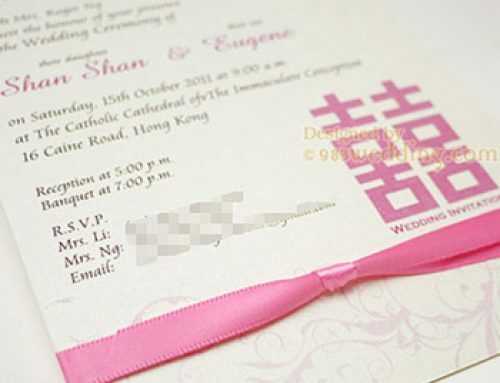 Unique wedding invitation with a design of flying butterflies around blossom MUI flowers. Chinese people believe that the red color is a good fortune color. This is why it is extensively used for different celebrations especially weddings. We keep this tradition in this wedding invitation design. 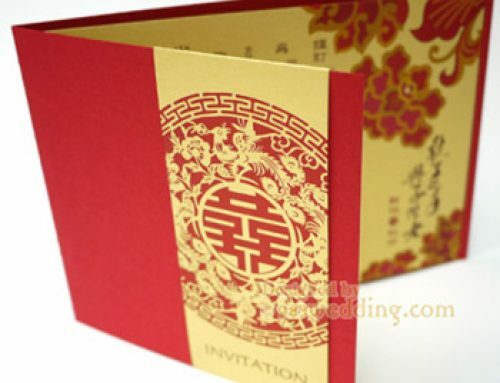 We use deep red color as the back of the invitation to make it a modern Chinese design. The two lovely butterflies playing around the MUI flowers (Cherry Blossom) bring the blessing towards the couples to start a new family together. This is a butterfly wedding invitation that every couple will love. In this design, we have combined both ideas of butterflies and cherry blossom as the main graphic elements. We attempt to make them a bit subtle because we would like to express the contrast between the back, which is in deep red color, and the front (in an off-white color). As a result, these graphic elements are not printed with bold colors. 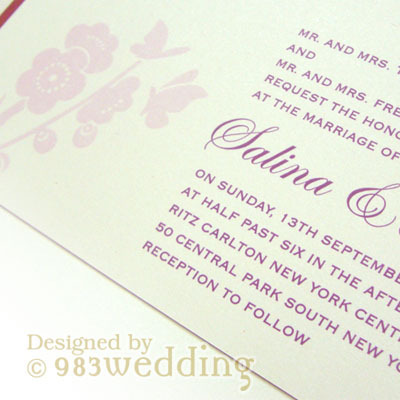 Instead, they are printed in light pink color. 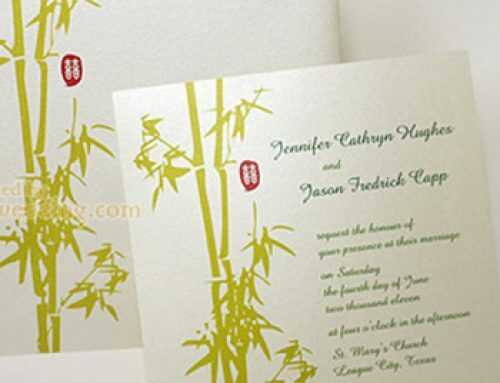 This color makes it possible to convert these graphic elements into a subtle focus of the invitation. Of course, the wording cannot be too subtle otherwise your guests will not be able to read the words. As a result, the wording is printed on the same side using royal purple color. 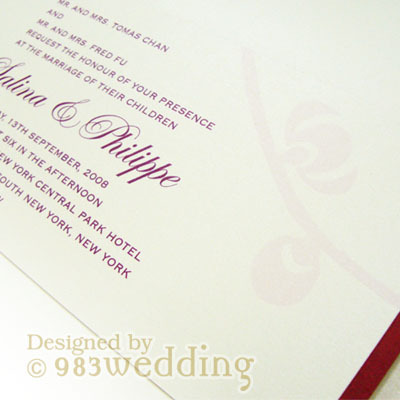 There are some brides and grooms who may think that a single panel design on a 300gsm paper will be too thin. This is one of the considerations when designing this invitation. We mount the pearlized paper to another red color paper to make it thicker. The two borders of red color will be seen on the left and right-hand side of the card so as to create a color contrast. As mentioned, this color contrast is one of the foci of the design. 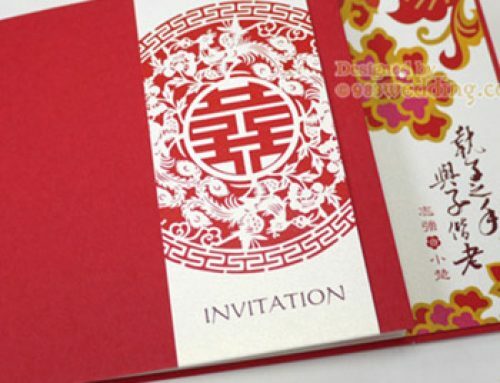 In fact, the backing red color paper does not only make the invitation thicker. 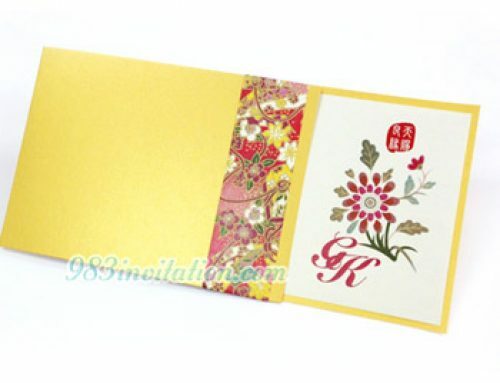 It also delivers the idea of modern Chinese wedding invitations. If a bilingual wedding card is needed, there are two ways to accomplish it. The most recommended way is to mount another panel at the back of this design. This will make the invitation card even thicker. That will certainly suit couples who want a thick wedding card. Another way is to print all the two languages on the same panel. However, it is not really recommended as the wording may have to be very small. You may want to go for this option only if you do not have a lot of words for your wording. 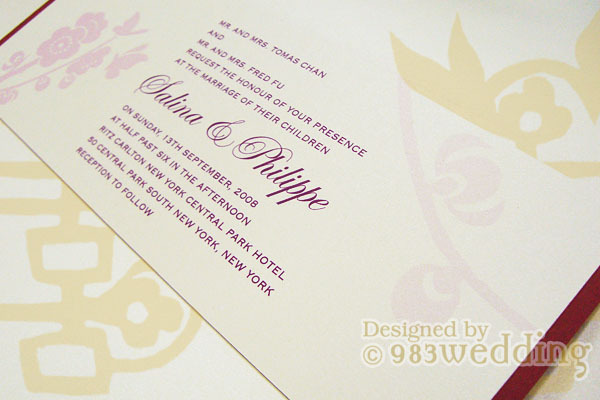 Pearlized paper with full-color printing on ONE side mount with 280gsm environmental deep red color paper. R.S.V.P. card, place card, menu, church program and thank you card can be ordered with the same design.